Click for info on more FJ parts and accessories from Rocky Road. 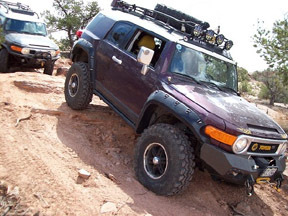 While the FJ Cruiser certainly has one of the more cool looks on the road of new vehicles, why be just another face in the crowd with your new Cruiser when you can install an OME FJ Cruiser lift kit and make your Toyota an even more capable off road vehicle as well as attention-grabbing head turner! and ARB Bumpers front and rear at the SEMA auto show. OME FJ Cruiser lifts are listed below. 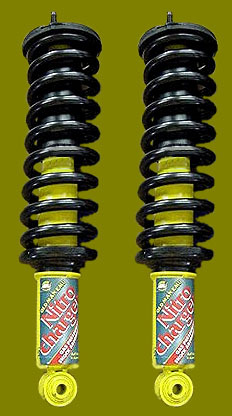 Some folks might ask why Old Man Emu suspensions are not available in taller lifts? OME's philosophy is quality and sensibility without complications. OME sizes their lifts such that there are no problems or modifications required to steering, braking, or drivetrain. Any taller and these items do become an issue. For most people, the extra inch or so isn't worth all the headache and cost necessary. Do it right the first time with Old Man Emu! ASSEMBLED Toyota FJ Cruiser Strut kits!!! NOW AVAILABLE from Rocky Road Outfitters.... Assembled Toyota FJ Struts! PLEASE NOTE: All Old Man Emu kits, sold thru any 4x4 shop leave the front of the FJ Cruiser low. FREE WITH PURCHASE OF A FULL OME KIT FROM (includes free diff drop too)!! 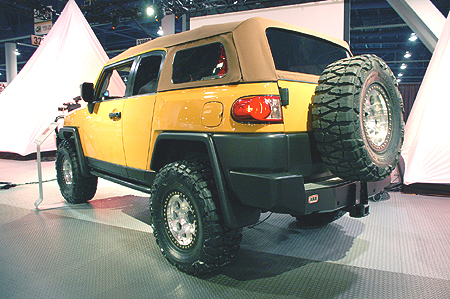 Also now available for your FJ Cruiser are Rocky Road Rockrails, and Supersliders. Click for more awesome FJ parts & Accessories! FJ Cruiser with 3" HD OME springs.